Young Adult Crisis Hotline and Biblical Counseling Center exists to provide Christian-based, sound biblical pastoral counseling to individuals, couples and families so that people experience life change emotionally, mentally, relationally, and spiritually. By "Christian-based" we mean that we operate from a Christian world-view that are built on Biblical principles and recognize that we are all spiritual beings who were created to be in a relationship with God. We diligently acquire knowledge on an ongoing basis related to how people think, feel, relate and act so that we can provide effective interventions. As Proverbs 20:5 indicates "The purposes of a man’s heart are deep waters, but a man of understanding draws them out," we understand the necessity of exploring and resolving root issues. At the same time, we aim to help clients to make helpful changes in present situations. Since God’s name "Emmanuel" means "God with us," we strive to create an experience in the counseling room whereby redemptive dynamics occur between the counselor and counselee. This requires the counselor to be "with" clients in ways that are therapeutic relationally as well as providing sound clinical treatment. In other words, we believe that significant healing and growth occurs in the context of relationships. The dynamics of the counseling relationship itself should be reparative, thereby providing a context for growth. 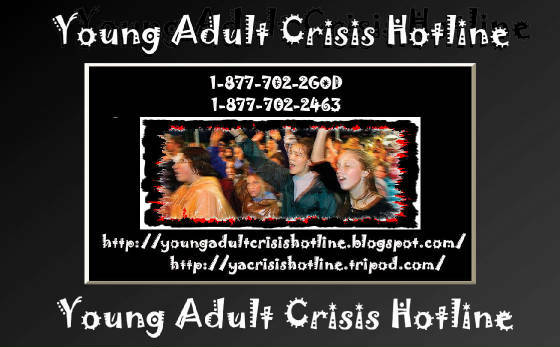 Finally, we have merely scratched the surface of what Christian Based treatment involves at the Young Adult Crisis Hotline and Biblical Counseling center. It is our goal to relate to people uniquely (just as Jesus did in the Gospels) since no two people are exactly alike. We do not have a single step by step blueprint that we use, rather we rely on the Holy Spirit and the knowledge base God has enabled us to acquire to guide us to a redemptive path of recovery. The counselors and staff of Young Adult Crisis Hotline and Biblical Counseling Center invite you to come and experience growth so that your life may be enriched as you resolve issues that may be small or very large. Our counselors have a wide variety of specialties and training that equip them to provide assistance with the many issues that face individuals, couples, families, and children. The counselor must have understanding of the dark side of life in order to diagnose, define the root causes of sin . This means a working knowledge of the definition of sin. Moreover, be comfortable about passing that knowledge onto a counselee. You are Christ’s ambassador when you enter into counseling. 1) Be compassionate – You must love the counselee enough to present him with God’s truth regardless of what truth may suggest for him. Example the rich young ruler (Mark 10:21). Do not force the solution on the counselee for he has a freedom of choice. Just like the rich young ruler, he was given the freedom of choice. He can reject or accept god’s solution to his problem. 2) Listen to the problem – You are a specialist in spiritual problems being more concerned in the counselees’ current problem instead of probing into the past. Listening is an art. You have the same confidence in the message of God as the surgeon has in the benefits of an operation. 3) Point the counselees to a solution – Do not jump into a solution hurriedly before you are sure of exact nature of the problem. Many people first talk of a “surface problem before they talk about their real problem. The word firm is important to know and not the word stern. When you are firm, you can be compassionate, but when stern you are striving in force. Give the person a solution from the word of God in a category. The apostle Paul wrote the believers in Thessalonica to “warn those who are idle, encourage the timid, help the weak, be patient with everyone” (1 Thessalonians 5:14). The term-translated therapy indicates service rendered to people in times of turmoil. In its historic context, therapy (or counseling) is the attentive, careful helping of others. Notably the closest Greek synonym for therapon is diakonos, which also means “servant.” We can glean from the resemblance of the therapist and minister. In fact, in the ancient world, therapeia was commonly translated into Latin as ministerium. Among the Greek words signifying “servant” (therapon, diakonos, oiketes, pais, doulos), the most intimate of these is therapon, which always refers to personal, considerate, and confidential act of service. The word “psychotherapy” may sound like a purely modern term, but its roots are ancient. The New Testament example of the therapon is Jesus Christ, the message and means of God’s intimate, healing, restoring service to all people (Matt. 9:1-8; Mark 1:32-34; Luke 4:18; et al). God Himself is the therapon, according to the kerygma, which means “proclamation.” The therapeia, which He renders, is the reflection of God’s redemptive love, portrayed in the banishment of demonic powers, and was made clear in the occurrences of the last days of Jesus’ earthly ministry. Psychology is man’s attempt to analyze the human condition and provide assistance. Most psychological theories contain some valid observations of human behavior, but they are usually based upon erroneous presuppositions about both man and God. Secular theories and practices, however, cannot provide the ultimate source of healing power: the love and strength of Jesus Christ. He is our Creator and Savior. He is the one who can touch our deepest needs and bring light and life. God reveals the nature of man as well as His own nature. The Christian counselor’s goal, however, extends farther to include helping the client love God with all his heart and to live by biblical values. In accomplishing this goal, the Christian counselor may present the gospel to someone who is not a believer or is unsure of his faith. He encourages the person to confess his sin and experience forgiveness, and also, to extend forgiveness to others. He helps the person understand proper behaviors and to take substantive steps to act appropriately and responsibly. The Christian, has transcendent values to motivate and guide, as Paul wrote, “For the love of Christ controls us, having concluded this, that one died for all, therefore all died; and He died for all, that they who live should no longer live for themselves but for Him who died and rose again on their behalf” (2 Corinthians 5:14-15). Reduce all the problems of human interaction, personality, and physical functioning to sin. In this paradigm, sin accounts for emotional distress, addictions, and other behavioral difficulties, and idolatry is the fundamental problem of mankind. Predictably, repentance is seen as the single solution to this problem. Individuals are responsible for both the problem and the solution. The Sickness Model – The idea that emotional problems originate from natural causes was popularized in the early years of the Alcoholics Anonymous movement. Dr. Silkworth introduced the disease concept of alcoholism to Bill Wilson, one of the founders of AA. Later, the disease concept was applied to drug abuse, and still later, to codependency. In this model, the person is not responsible for the perceived medical problem, just as he is not responsible for contracting the flu. The GRACE Model – The psalmist proclaims that man is “fearfully and wonderfully made” (Psalm 139:14-15). We are made in the image of God, but we are deeply fallen. Individuals are Personally responsible for acting out in their fallen nature and the only solution is death through the cross by the wonderful grace of God which teaches us to deny all ungodlinees. The solution is the Grace of God, not by our own work or behavior modification can we fix our selves or our own problems. We are deeply fallen, which includes physical, mental, emotional, behavioral, and social aspects of our being. Virtually every problem we have is multifaceted; its solution is then multi-modal. For instance, an addict has chosen coping mechanisms outside the will of God to block pain and to gain a sense of value or control. There are usually factors outside his control, and therefore, outside his responsibility, such as childhood trauma, poor parental modeling, cultural reinforcement, and biochemical deficiencies. The biochemical dependencies may require detoxification. Effects of depression may require medication to enable the person to think clearly and make wise choices. New communication skills need to be learned, and new courage needs to be acquired in order to follow through with the communication and the skills. Repentance is right and appropriate in particular points of responsibility, but we do not repent of the wounds received from others or of biological factors outside our control. The complexities of the human experience demand that counselors carefully take a complete history on each person. Past and current emotional traumas, environmental and family difficulties, physical problems, behavioral manifestations need to be considered in order to make an accurate assessment. The goal is that the person will feel better, but also take steps toward knowing, loving, and following Christ. For Christians, recovery is inherently a part of the process of sanctification, including foundational spiritual issues of our identity, repentance, and our motivations. Bible-based teaching, prayer, meditation and other Christian disciplines must be used knowledgeably. Quite often, spiritual behaviors are held most tightly, perhaps because they falsely represent God and ultimate authority and safety. Giving them up is both difficult and confusing to many people. We need to show the negative effects of trying to find ultimate meaning and safety in these activities, and also, we need to present the Lord, Himself, and the attractiveness of a vital relationship with Him.